I've been having a blast this summer entertaining. Nothing huge or fancy. More like a few small, intimate gatherings with appetizers, desserts, and other lighter fare on the menu. I don't know about you, but a new cookbook is like gold to me. I'm thoroughly enjoying my copy of THE COZY CHICK'S KITCHEN. I joined this blog after the book came out, so I haven't contributed any recipes, but that's good news because it means that all of them in there are new to me, and boy, are they great! Over the weekend, for instance, I made Ellery's Warm Chicken Salad and served it as an appetizer. Everybody here gobbled it down because it was so wonderful. My husband kept saying "You're going to make this again, right?" Most definitely. We've got another go-to recipe here thanks to Ellery. We had a little bit leftover. Was I a nice wife who saved it for him for dinner the next day? Nope. I had the best lunch, enjoying every last morsel. If you haven't made this yet, do yourself a favor and give it a try. The recipe calls for 3 cups of cooked chicken. I took the easy way out and bought one of those rotisserie chickens at the grocery store. Because it was an already-cooled one, not a hot, fresh one, the store had priced it at $1.99. An entire chicken for $1.99 - seriously. This dish was delicious and economical! In the spirit of summer entertaining, I thought I'd share an easy recipe for peach sangria. We served that this weekend too, alongside the chicken salad and a few other tasty offerings. My husband and I prefer red wine, but the summer's heat makes reds feel heavy and thick. For this recipe, we took a trip down the white wine aisle and we're very glad we did. 1 bottle white wine - We used an inexpensive Gewurztraminer, but a Riesling could work, too. A Spatlese or Moscato might be too sweet, but then again, that may be your preference. I'd avoid chardonnay and chablis. Easy, isn't it? I wouldn't load it up with ice unless you're serving immediately because you don't want to dilute it overmuch - but this does taste much better when it's chilled. I made it a couple of hours ahead of time and popped it into the fridge. We tossed a few ice cubes into our glasses when we served it and it was perfect. What are some of your favorite go-to dishes when you're entertaining? And what are some of your go-to cookbooks? 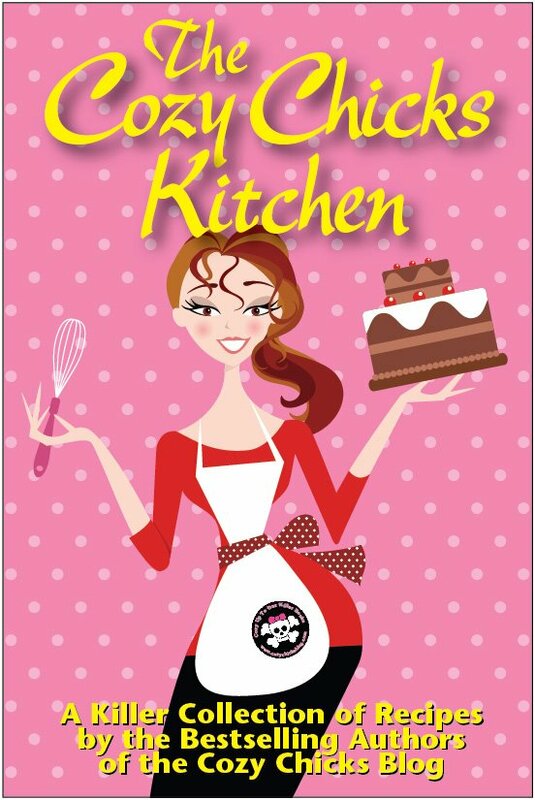 PS - Do you have your copy of THE COZY CHICKS KITCHEN? If so, would you like a bookplate signed by all the contributors? If so, send an email to cozychicks(at)gmail(dot)com and ask for one. Simply put BOOKPLATE in the subject header - and don't forget to provide a snail mail address!